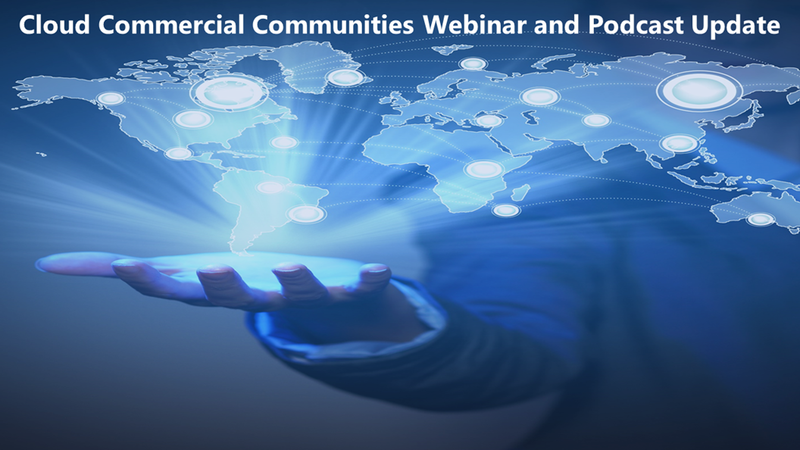 Welcome to the Cloud Commercial Communities monthly webinar and podcast update. Each month the team focuses on core programs, updates, trends, and technologies that Microsoft partners and customers need to know so that they can increase success in using Microsoft Azure and Dynamics. Make sure you catch a live webinar and participate in a live Q&A. If you miss a session, you can review it on demand. Also consider subscribing to the industry podcasts to keep up to date with industry news. Microsoft for Startups is a unique program designed to help startups become a Microsoft business partner through access to technology, channels, markets and customers. Tune into this session to learn more about the Microsoft for Startups program, a $500 million initiative to provide startups access to both the technology and customer base needed to build and grow their business. Evolving actuarial risk compute and modeling on Azure – Nick Leimer shares changes occurring in the insurance industry and how companies are dealing with it. Specifically, we look at computing risk for regulatory compliance and how it might be a good match for Azure services, like Azure Batch or Azure High-Performance Computing. Reduce healthcare costs with digital transformation: security, compliance, and backup on Azure – Healthcare IT veteran, David Houlding, chats with us about reducing costs in healthcare as part of an organization’s digital transformation and specifically outlines the tools and techniques needed for these transformations to succeed. Adopting Azure for real-time payments – In this episode, Howard Bush talks with us about enabling real-time transactions instead of the customary batch transactions that financial institutions use today. The full lifecycle of implementing IoT with PTC – From planning to streaming analytics, this episode looks at all phases of introducing IoT to a company. Just having the data is often not enough to make decisions. Insights must be gleaned from that data. Live now – Joel Neidig of SIMBA Chain talks with us about blockchain as a service – The podcast focuses on blockchain as a service and how it can be leveraged in manufacturing. With very real use cases and stories of success, we'll see how blockchain is affecting manufacturing in various ways today. Live now – Using Cognitive Services with containers – Container support in Azure Cognitive Services allows developers to use the same rich APIs that are available in Azure and enables flexibility in where to deploy and host the services that come with Docker containers. Transform Your Business with AI at Microsoft – Explore AI industry trends, how the Microsoft AI platform can empower your business processes, Azure AI Services including bots, cognitive services, and Azure machine learning. Azure Marketplace and AppSource Publisher Onboarding and Support – Learn the publisher onboarding process, best practices around common blockers, plus support resources available. Build Scalable Cloud Applications with Containers on Azure – Overview of Azure Container Registry, Azure Container Instances (ACI), Azure Kubernetes Services (AKS), and release automation tools with live demos. Blockchain, artificial intelligence, and machine learning what does it mean for healthcare – David Houlding, a Microsoft Principal Healthcare Program Manager, discusses topics such as blockchain, artificial intelligence, machine learning as they impact healthcare. Real world insights working with machine learning projects – Jess Panni and David Starr share insights learned from machine learning projects and the use of Machine Learning Studio to get actionable insights from the data produced.